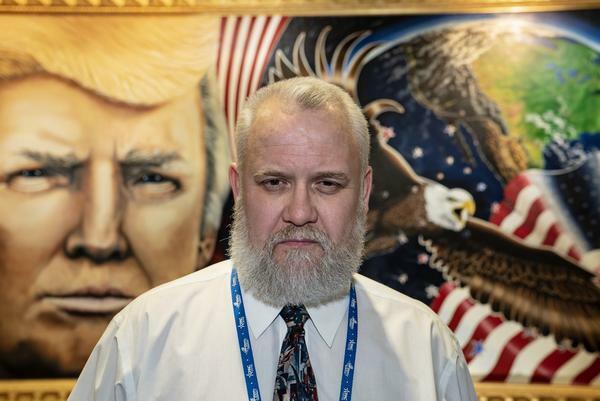 Julian Raven of Elmira, N.Y., stands in front of his 8-by-16-foot painting of President Trump, inspired by a vision of Trump's potential restoration of America. "I like the president," said Alex Woods, 23, from Florida. Adding what he likes about Trump is "that he gets stuff done, keeps campaign promises, you know, gets straight to the point." For Woods, the point is building the wall. "But, like, see it would be political suicide for Democrats to support it," he said, "because they would lose the Spanish vote. What it's got to come down to is we're Americans, and it's got to be America first." A young supporter in the crowd wears a "Make America Great Again" hat. Donald Trump's 2016 campaign slogan is the clear message of the CPAC. Gabrielle Lawrence, 20, from Maine said she supports the president because of the strong economy and also because she wants the wall built. "The wall is important," she said, "because I think it represents something really big, because we do have a big problem with illegal immigrants coming over." Patrick Ragozzine of Georgia graduated from high school last year and took the year off to work on a local state representative's campaign. 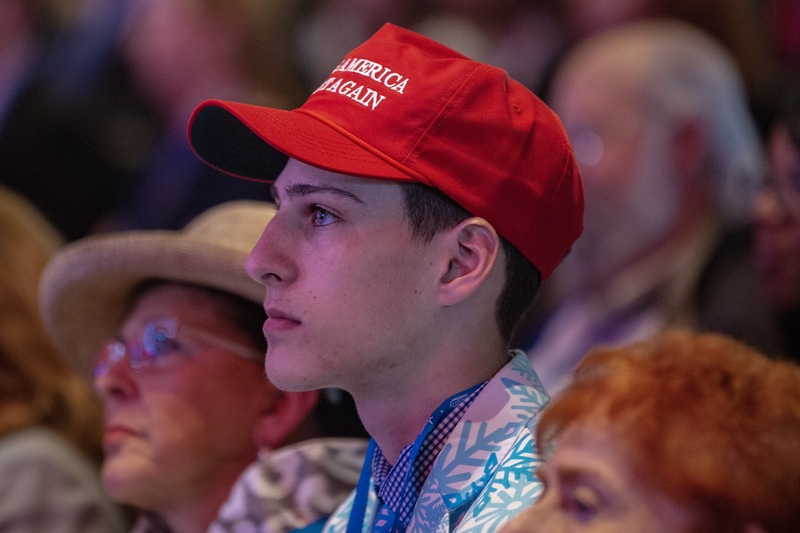 He'll be a college freshman in the fall and said he came to CPAC to meet like-minded conservatives and to "show support for the president." Ragozzine said he likes the president's tax cuts, the conservative judges he has nominated and what he has been doing with immigration and border security. "I think that the direction our country has been moving in for the past 10 years isn't really the direction I want it to be moving in," he said. "So I want to come support the president and 'America first.' "
CPAC has evolved over the years. Always a gathering place for young activists from across the country, the emphases have changed. The Republican Party is a three-legged stool made up of national security hawks, fiscal conservatives and social values conservatives. In years when George W. Bush was president, the hawks dominated. It was a place to rally the faithful behind the "global war on terror" following the 9/11 attacks. With Barack Obama in the White House, this was a hive of political candidates and activists trying to figure out the way forward. And it was, for a few years, dominated by the economic libertarian strain of Ron and Rand Paul. That has faded, superseded by the culture wars – abortion, immigration and warnings about the embrace of socialism (especially among young people). Trump economic adviser Larry Kudlow told the crowd that he wanted to put socialism on trial and wanted them to "convict it." The pro-Trumpism here is punctuated by the red dots of "Make America Great Again" hats adorning young people in the crowd and the adopting of Trump's rhetoric. "Build the wall" and "America first" weren't part of these conservative activists' lexicon before Trump. But now those words on the tips of everyone's tongues. Talk in the hallways is of the wall (and beating Democrats). There's even a fake wall, made of cardboard bricks, on display. 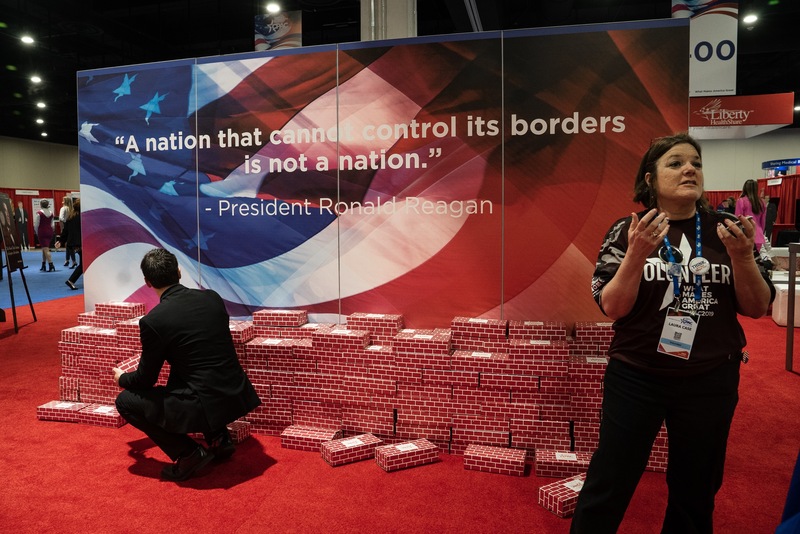 A fake wall, made of cardboard bricks, is on display with a quote by former President Ronald Reagan that reads: "A nation that cannot control its borders is not a nation." Vice President Mike Pence appears before the Conservative Political Action Conference, or CPAC, on Friday. From the audience, it's hard to miss the theme of the conference, which is in bold block letters on stage — "What Makes America Great." From that stage, there's been talk of Democratic obstruction — from Elaine Chao, Trump's transportation secretary and wife of Senate Majority Leader Mitch McConnell. Democrats are "invoking cloture at every step of the way," Chao said with seeming disbelief. She noted, "It's not the Senate majority leader's fault." McConnell set a record for use of the filibuster while in the minority in attempts to block Obama's policies and judges. CPAC organizers argue that Trump has come around to many of their positions and that not everything talked about here lines up cleanly with the president. There was, for example, a panel on reducing the national debt with Republican Sen. David Perdue of Georgia. The debt has gone up under Trump, and that's something far from the core philosophy of the Tea Party, to constrain spending. Republican Sen. David Perdue, who spoke about reducing the national debt, takes a selfie with a young MAGA supporter. Instead, it's the culture wars that now dominate. There was heavy talk of abortion from the main stage. Penny Nance of Concerned Women for America even proclaimed that Trump – Donald Trump – is "the most pro-life president in my lifetime." Former Wisconsin Gov. Scott Walker compared abortion to taking a baby home and killing it. For Raven, the painter, his artwork was inspired by a vision of Trump's potential restoration of America. Each brush stroke seemed to be full of symbolism. One of the tiny tears in the flag, for example, is a fetus, Raven pointed out. And there's a full-length wall in the painting along the border with Mexico. It includes a big, beautiful door. What's at the heart of why Raven, born in England and raised in Spain, chose to paint this? "When we depart from our Judeo-Christian values, the boundaries of right and wrong are lost," Raven said, adding, "People have lost respect for our country. The Latin countries, especially, think they can just march into our country. Show respect. We're, like, your neighbor. We don't want a wall; we have to have a wall." 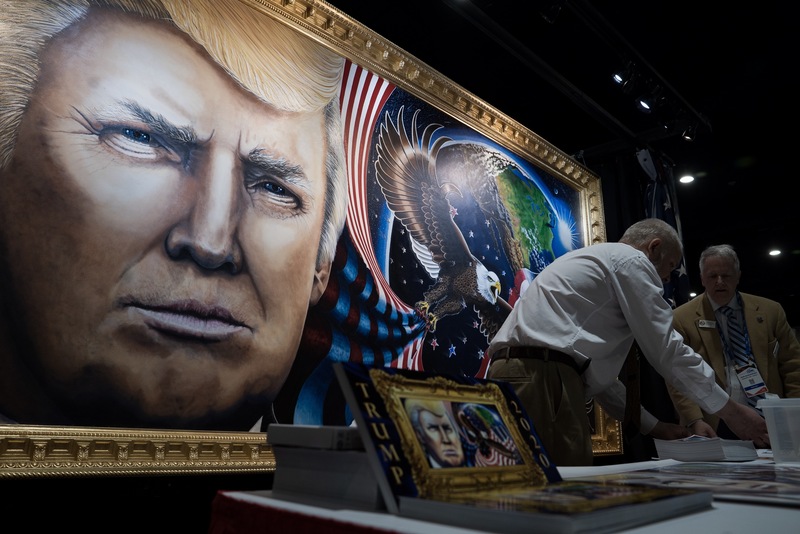 The 8-by-16-foot painting of President Trump by artist Julian Raven is on display at the Conservative Political Action Conference in National Harbor, Md. There is little dissent here with the president – save from some concern over the "precedent" it might set for Trump to have declared a national emergency. And few attendees bring up the debt. 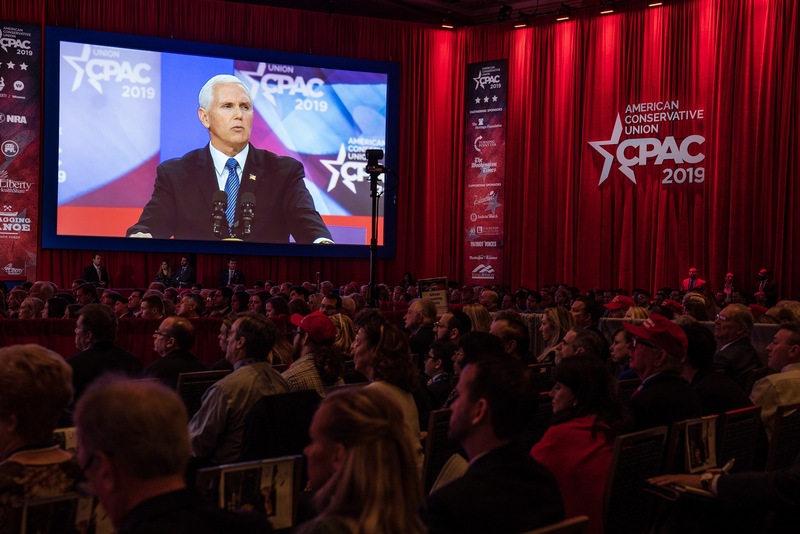 CPAC, as to be expected perhaps, has amounted to not much more than a pep rally, a corralling of the troops for the president's re-election bid. That's fairly typical at partisan political conferences the year before a president runs for re-election. In fact, the hottest debate might have been one in the hallways Thursday over how to pronounce MAGA, the acronym associated with Trump's slogan, Make America Great Again. "Why are we saying MAH-guh?" asked one attendee to another, patting him on the back and taking a photo. "Shouldn't it be MĂ [like mat]-guh?"